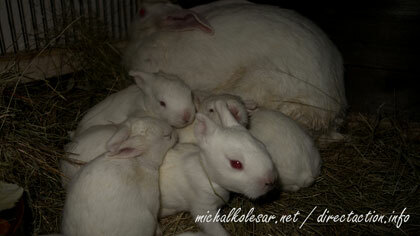 A rabbit mom gives birth eight times every year. She does not want to but she has to. Each time there will be 7-10 little rabbits. After 78-82 days they are declared mature enough for the slaughter and they will be killed. We took one mom and her ten kids from such a place. We drove them to the safety. To people who won't kill them. Thanks to those who offered their homes. At the farms of the Czech Republic there are approx. 5.414.000 rabbits (estimation from October 2015). They are killed for their meat and fur. Almost 303k of them were brought from Slovakia, Poland and Hungary to be killed or to be used as 'a breeding material'. (Further info: 2015 Situation and prospective report, Ministry of Agriculture). In 2011 Walter Bond was sentenced to 12 years of prison for arson attacks on a leather products shop, a restaurant selling foie gras and a factory processing sheep skin. Since November 15th 2017 he is on a hunger strike because he does not receive vegan meal in the prison, his mail is being unreasonably delayed and they are refusing to transfer him to another facility."